I've been getting more interested in coffee cake lately, after one of our guests brought a particularly delicious one to the Lasagna Lunch. 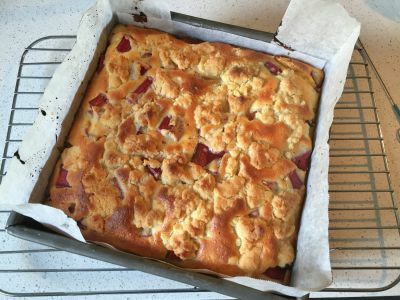 I've also recently rediscovered one of my favorite flavor combos from my first stint in Australia - rhubarb and peaches - when the first peaches of the season turned up at the farmer's market. I combined them to make a coffee cake which, though I say it myself, was thoroughly delicious. Heat oven to 350F/180C. Line an 8 in/20 cm square cake pan with parchment paper. Make the crumb topping by whisking together the ingredients. (I also added some cinnamon, cardamom, and ginger to the mix.) Set aside. In a medium-sized bowl, whisk together the dry ingredients. In a medium-sized jug, whisk together all the wet ingredients except the butter; add the butter slowly and carefully last, so as not to scramble the egg. Dump wet into dry and whisk until just combined. Scoop all but about one cup of the batter into the prepared baking pan. Scatter the fruit across the surface of the batter, then do the same with the remaining cup of batter and the crumb topping. Bake for 25-30 minutes or until lightly browned, rotating pan halfway through.